If you have not seen this film, then wait to read this review. This reviewer is going to take a stab at explaining the film's ending. 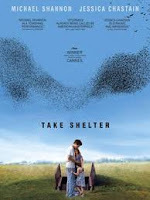 As backstory, Take Shelter received a limited theatrical run and now the film is moving to DVD and Blu-Ray February 14th. The film stars Michael Shannon as Curtis a man who sees apocalyptic visions in the skies and in his dreams. Even the first scene shows a man's face with an exploding head. What could that mean? Curtis is your average family man: a blue collar worker, a brother, a father and a husband. However, he is extraordinary in his ability to see powerful visions. What he sees is an assortment of violent characters, bad omens, storms and the world going to hell. Curtis is also a man with a history of schizophrenia in his family. His mom was diagnosed with this mental illness in her 30s. Now, Curtis is thirty-five and all of the chips stack up to say that the protagonist is also developing paranoid schizophrenia. The ending says something completely different. Early impressions of this film involve dread. 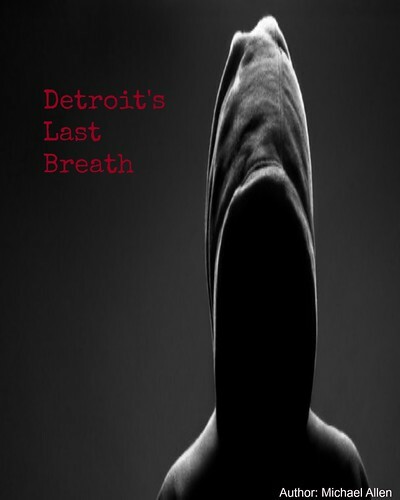 David Wingo's score amplifies the tension and the music pairs with the film's tone; something this way comes. There are a number of scenes involving CGI, so fans of more practical effects might not enjoy this element. As well, the pacing is slow early, but once the nightmares begin there is steady build of tension right into the final scenes. This is a powerful film and thriller or drama fans should take notice. Only the ending leaves one with a little disappointment. Centrally, Take Shelter is a film about coping with mental illness. This reviewer is enjoying this new approach to the subject of mental illness. Jeff Nichols, with his script, portrays a man devolving. Curtis loses his job because of his strange behaviour, including building a large storm shelter in his back yard. He gives his dog away and when he awakens his wife with seizures, you know something is wrong. Yet, Nichols takes the story one step too far and the only thing more annoying than the film's final set-up is the reading of how many critic's predicted this final scene. Oil begins raining from the sky and several funnels develop over the water. Curtis' predictions have come true and the film shifts from covering and coping with mental illness to something a little more short sighted. Perhaps Nichols is warning viewers of another looming apocalypse and the falling oil should signal where the end will begin. There is a looming environmental catastrophe on the horizon as Nichols would have you believe. Outside of the final scene, this is an excellent film that covers the little tragedies that can befall a family whether the cause is emotional, physical or otherwise. Expertly written, Take Shelter keeps you watching until the tension filled ending. All other film elements from music to acting are also superbly done and this reviewer suggests that you pick up a copy of this film on Valentine's Day. And just see this film for what it is: a straight forward look at schizophrenia and its impact on family. Relating the film to a global apocalypse is not supported by much of the film and its inclusion is more of an attempt to unsettle the viewer and their feeling of safety, which is a similar feeling experienced by Curtis with his eerie visions. Don't miss this film! Overall: 8 out of 10 (great writing, compelling, complex, layered, emotive, and very dramatic). *can you see the exploding mind in the movie still? It is along the bottom border of the picture, but hard to see. **actor Michael Shannon also recently starred in My Son, My Son What Have Ye Done? This was a film that also dealt with a man with mental illness.